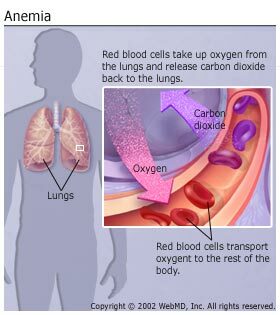 Anemia is a condition where your blood lacks of red blood cells. These cells are the main transporters of oxygen to organs. If red blood cells are also deficient in hemoglobin, then your body isn't getting enough oxygen.People may think that chunky people can't get anemia because we eat to much and probably eat more iron that is needed in our blood. Well it is not true everyone can get anemia no matter what size you are. what matters is what you eat and if you have blood problems.The symptoms are fatigue,rapid heart beat when excersinsing,dizziness,pale skin,and insomnia.what caused anemia is by variable things.Anemia can be caused by blood loss,decreased red blood cell production,and lack of iron in your blood. Anemia caused by blood loss can be lost through bleeding,which can occur slowly over a long time period of time and can often go undetected.This kind of chronic bleeding commonly results from the following: use on anti-inflammatory drugs such as aspirina and motrin,menstruation and childbirth in women.especially if menstrual bleeding is excessive and if there are multiple pregnancies.Decreased faulty red blood cells production may produce few blood cells that don't function correctly. some types of this abnormal stage is sickle cell anemia,iron deficiency anemia,vitamin deficiency,bone marrow and stem cell problems,and other health conditions. · Dietary deficiency: Eating little or no meat may cause a lack vitamin B-12, while overcooking or eating too few vegetables Other causes: pregnancy, certain medications, alcohol abuse, intestinal diseases. When red blood cells are fragile and cannot withstand the routine stress of the circulatory system, they may rupture prematurely, causing hemolytic anemia. Hemolytic anemia can be present at birth or develop later. Known causes of hemolytic anemia may include: Inherited conditions, such as sickle cell anemia ,Stressors such as infections, drugs, snake or spider venom, or certain foods,Toxins from advanced liver or kidney disease ,Inappropriate attack by the immune system (called hemolytic disease of the newborn when it occurs in the fetus of a pregnant woman),Vascular grafts, prosthetic heart valves, tumors, severe burns, chemical exposure, severe hypertension, and clotting disorders ,In rare cases, an enlarged spleen can trap red blood cells and destroy them before their circulating time is up. Anemia is the most common blood condition. It affects about 3.5 million Americans. Women and people with chronic diseases are at increased risk of anemia. Certain forms of anemia are hereditary and infants may be affected from the time of birth. Women in the childbearing years are particularly susceptible to a form of anemia called iron-deficiency anemia because of the blood loss from menstruation and the increased blood supply demands during pregnancy.What Can I Do to Prevent Anemia? The best sources of iron are the foods you eat. By eating foods that are high in iron and vitamin C, you may be able to prevent anemia. Some iron-rich foods are: Red Meats,liver,dried beans or tofu, dried fruits, leafy green vegetables,iron-enriched bread,pasta,and cereal, and eggs. which everyone atleast needs to check their anemia once a year. No matter age, race, gender, height,and, weight it is always good to take blood test to see how you are doing. Don't be afraid its just a little poke.If you can resist a tattoo you can resist a little poke.